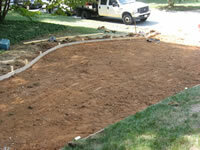 Damaged concrete can be removed and replaced, with either poured, smooth concrete, or stamped concrete. 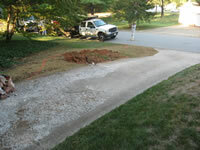 The pictures below show a 35 year old driveway that was crumbling badly across the entire middle section. 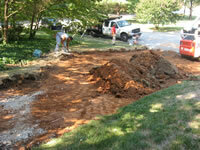 The homeowners were looking for the most economical way to deal with this problem. 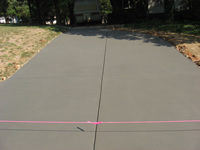 Dean Alley, owner of Bobby's Concrete, suggested that they replace from the middle section down to the street - the most visible portion of the driveway - to get the best appearance for the driveway without having to replace the whole thing. The homeowners were also unhappy with having to park behind each other. 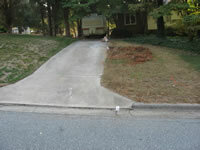 Again Dean had a solution - he widened the lower portion of the driveway to provide parking for two cars. Another job well done - with very satisfied customers. 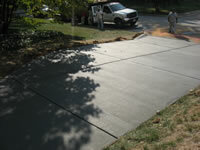 Call Bobby's Concrete at 336-382-1031 for a free estimate on your concrete repair job.